Place water, butter and salt in a medium saucepan and bring to a boil over medium heat. Remove from heat and add flour, and stir until combined. Return to heat and stir cooking the flour mixture until it comes away from the sides of the pan and is a shiny ball. Place in a food processor with plastic blades and process for 15 seconds (give or take). Add eggs and process for 40 seconds (err on the longer side of give or take). Add both cheeses and process for another 5-10 seconds until smooth. Using a wet spoon, place thumbnail-sized spoonfuls on a parchment lined cookie sheet about 1 1/2″ apart. i don't see a baking step and direction . . . is it missing ?? . . .
Baking step and directions are from 7-10! 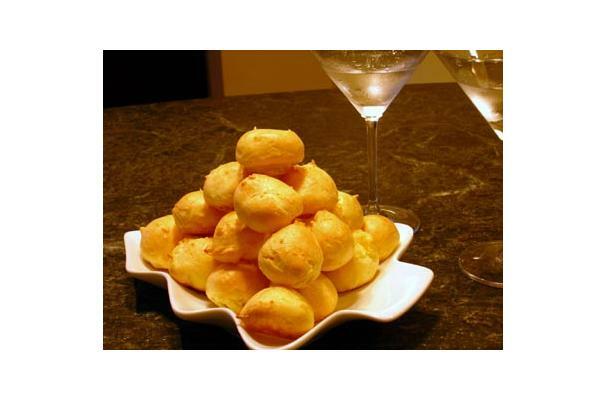 These little gems make a lovely hors d’oeuvres on their own or stuffed Makes about 40 little bite-sized puffs! They puff up about 12 minutes into baking and are ideal for stuffing with a piping funnel (I bought a really cheap one from a dollar store and it works very well). Stuff with goat cheese or your own recipe.